Part of a super Division III group from the CCS is this week's DyeStatCal Athelte of the Week, with Michelle Gallagher, who is off to another great season of running. 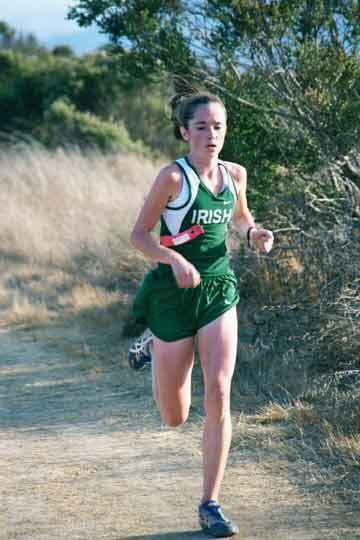 She has had some great experiences in high-school, including racing in the World Cross-Country Championships in front of her family there in Ireland!! 1) Briefly describe your Invitational series of races this season so far? I haven't competed in many invitationals this season, but in the ones that I have competed in have been challenging, especially the course in Carson City, Nevada. One of the things that we were taught in Irish Dancing competition was if you fell you were to jump up immediately and keep on dancing unless you were badly injured. After I fell I was unable to jump up as quickly as I wanted to as all I could see were runners coming at me. I tried to cover my head, but I still got kicked, and I was never so scared in all my life. After everyone had left I jumped up, started to run and as my coach Andy Chan pointed out later that I met all of the competitors along the way. Toro Park, the new home for CCS was different from what I expected. Now that I have competed there once I will be better prepared for CCS. 2) Talk a bit about the quality of competition within your League and how that motivates you? This year the newly formed league has awesome competition. The top athlete's are all phenomenal and that gets my adrenaline going. It could be anyone's race on any given day. Over the past few years I have improved on my times becoming more experienced through every race. I was given a wonderful opportunity of competing in the Irish Nationals and qualifying to represent Ireland at the World Cross Country Championships in Dublin. It was one of the happiest days of my life having my grandmother come out to cheer me on. 4) How much running did you do this summer in preparation for this season? During the summer I did some base training, ranging from 30-40 miles a week. 5) What are some of your goals for the fall cross-country season? My goal for the fall cross-country season is to keep on improving and staying injury-free. 6) Any info on possible college choices? Undecided at this time. 7) What are your favorite kind of running workouts? I like long scenic runs in Golden Gate Park and as I am an animal lover it gives me an opportunity to admire the cute dogs along the way. It also gives me a chance to relax and enjoy my surroundings. 8) What are your least favorite kind of running workouts? My least favorite workouts are short intervals, but nevertheless they must be done. 9) What are some of your interests outside of school and running? I like to do Irish Dancing, volunteer at running events, and hang out with my friends. I would like to become a neo-natal nurse, and an elite marathon runner. 11) What advice would you have for runners who are just starting out as maybe a ninth grader - what motivated you and kept you going early on? After your first couple of weeks of running and your thinking to yourself, "Oh my God I can't do this" you need to remind yourself that you are just starting off and things will get a lot easier along the way. Don't give up and stay true to your dream. I have found that the team spirit at SHC will get you through anything. What kept me going was my love for running and having a positive attitude.